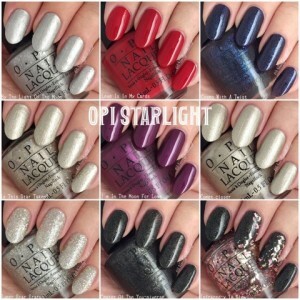 Are you guys ready for the second part of our swatches for this year’s Holiday Collection from OPI?!? 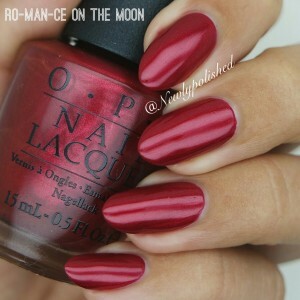 First up is ’Ro-Man-Ce on the Moon’! This is a red metallic/shimmer polish. A teeny tiny bit streaky but besides that, it’s a lovely color! 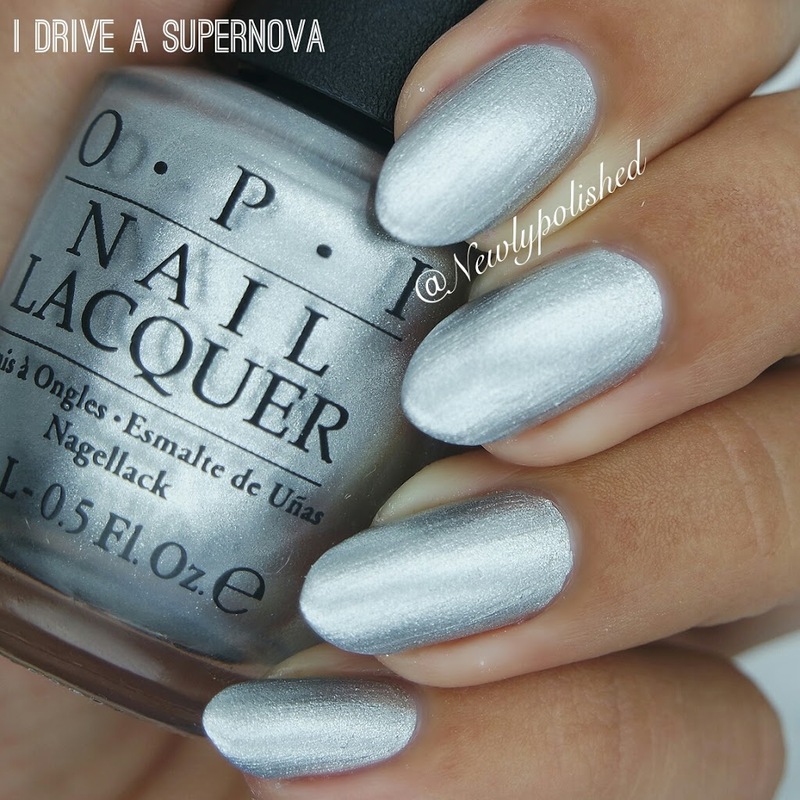 ’I Drive a Supernova’ is also a mix between metallic och shimmer. 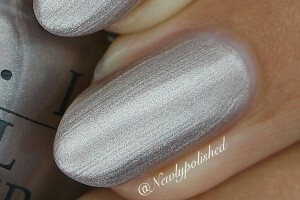 Unfortunately, I feel like I’ve seen this silver-y polish before, and not just once. The coverage is good and is opaque in two coats. 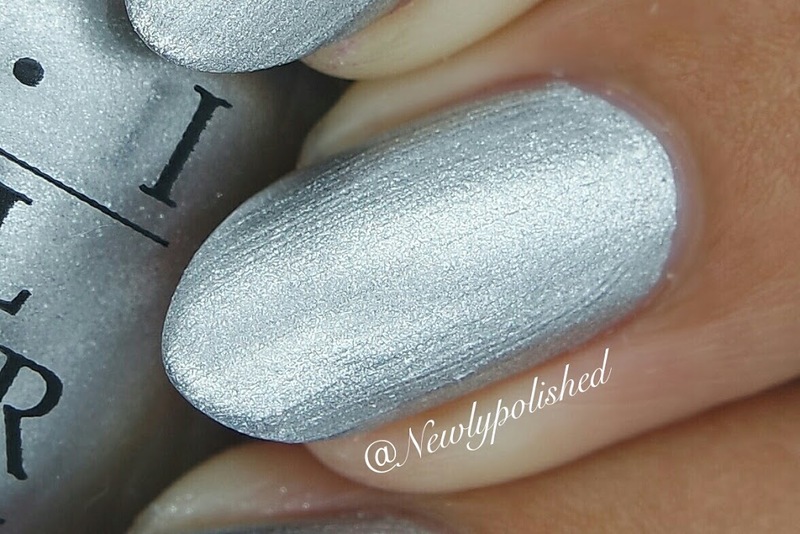 ’Press * For Silver’ is a silver-ish metallic polish but with a hint of pink or rose gold. Even though it does apply a bit streaky, I still like the color! One of the reasons is probably because I don’t a nail polish like this. Two coats for full coverage. All right, now we’re talking! ’Let you love shine’ is a red shimmer polish. 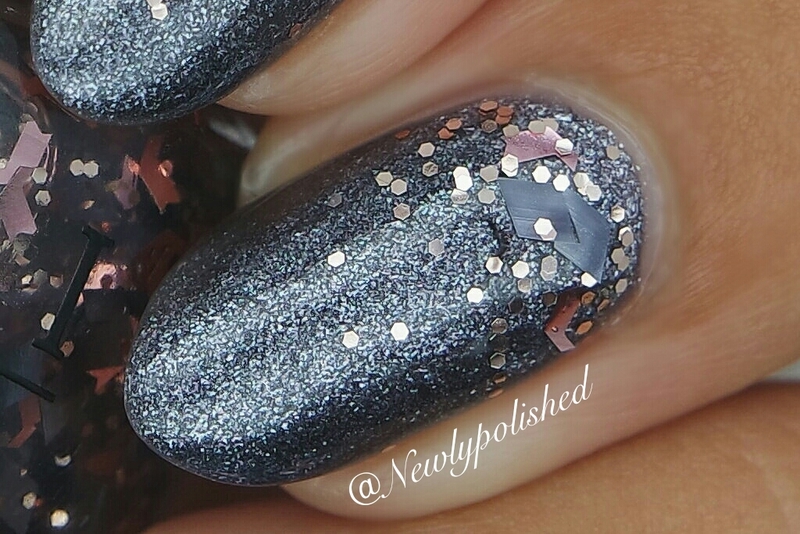 I absolutely love the shimmer and sparkle! 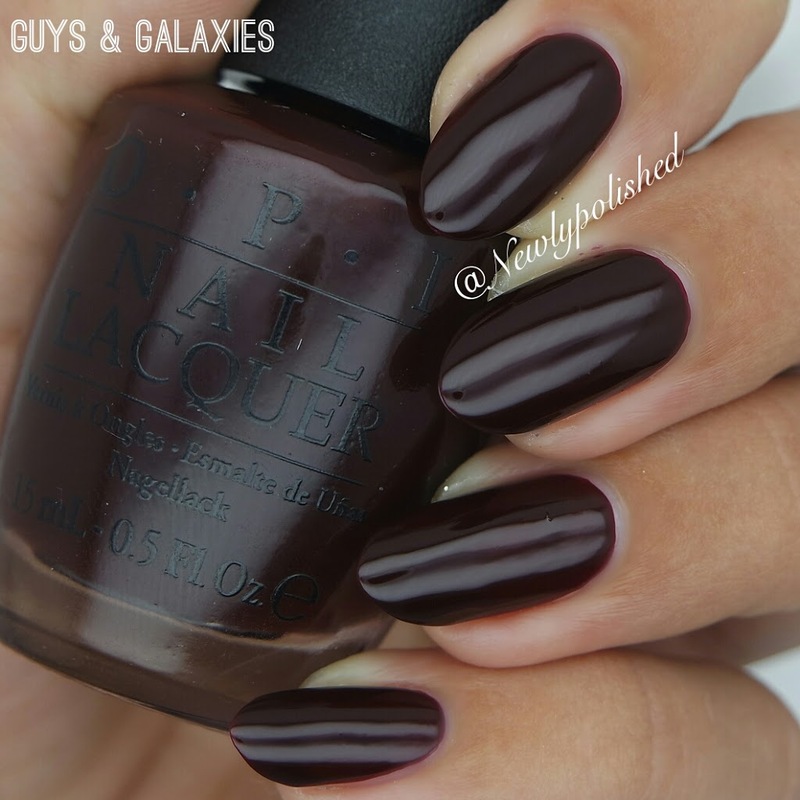 I applies beautifully and is opaque in two coats. 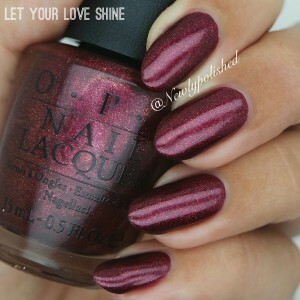 I definitely feel like I could wear this color for Christmas! ’Guys & Galaxies’ is one out of the everyday wear-colors from this collection. 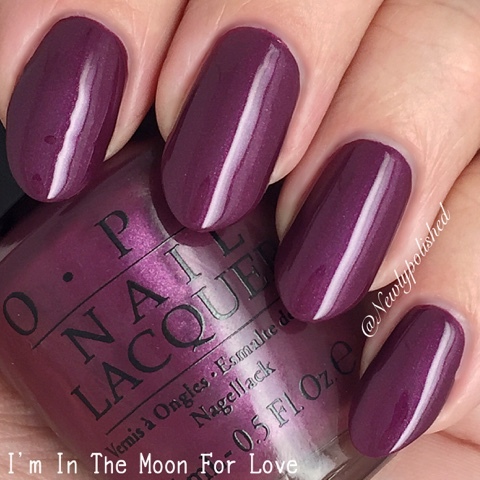 It’s a gorgeous dark, burgundy and the formula is perfect! One of my favorites. Two yummy coats for full coverage. 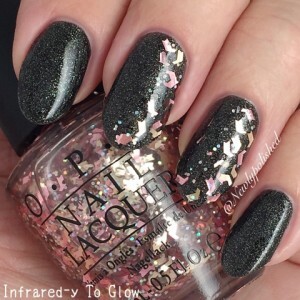 OPI’s description of ’Ce-Less-Tial Is More’ is ’a pink super-glitter with heavenly light’ and I couldn’t agree more! 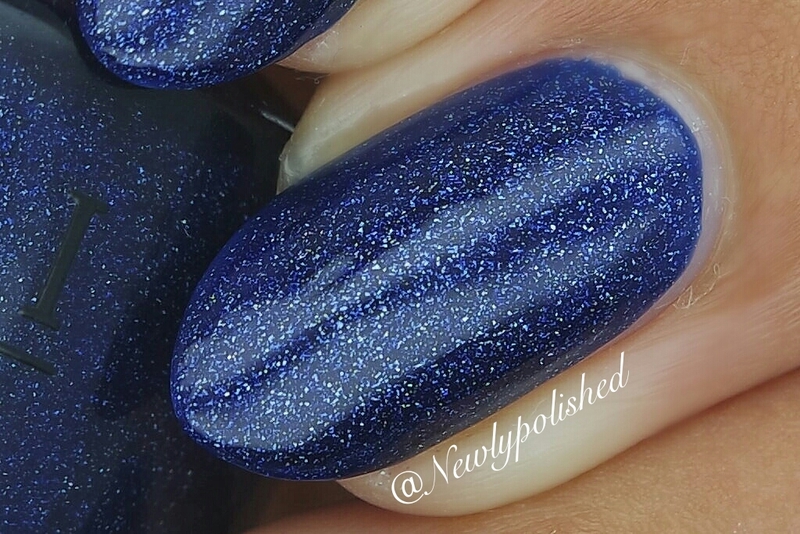 It dries matte and textured, pretty much like the liquid sand polishes, but I’ve applied top coat to this swatch and that does the trick if you prefer it shiny! It’s jam packed with glitter and almost a one coater. 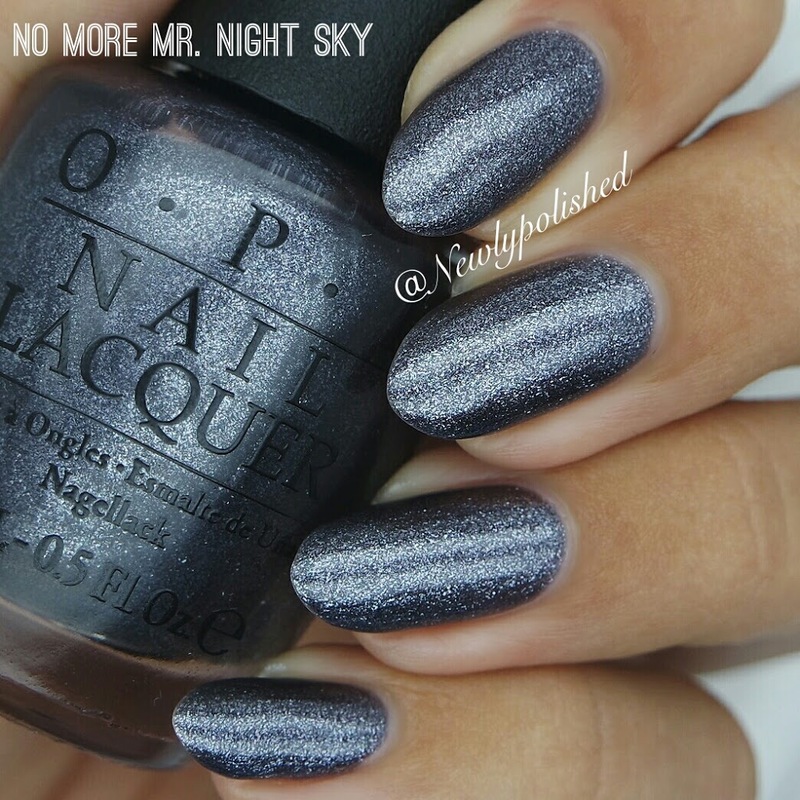 Say hello to ’No More Mr. Night Sky’! 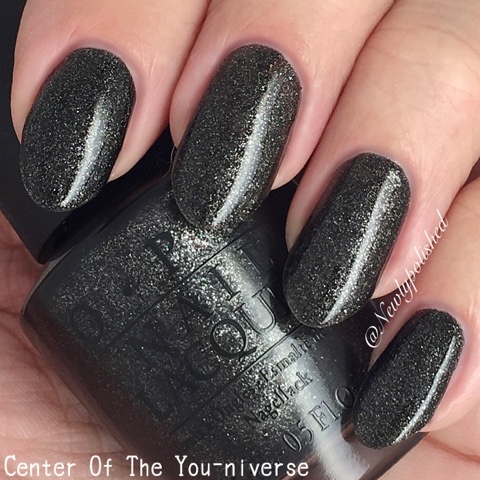 This color is dark, shimmery and a perfect shade of grey. 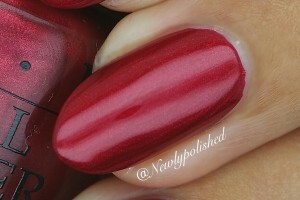 I thoguh the formula was a bit thin at first but you get perfect coverage in two coats, so don’t worry! This color is definitely perfect for New Year’s. 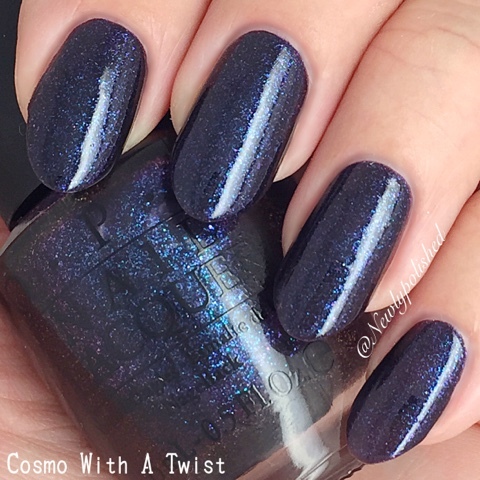 ’Two Wrongs Don’t Make a Meteorite’ is a confetti glitter with a mix of different shapes and colors. 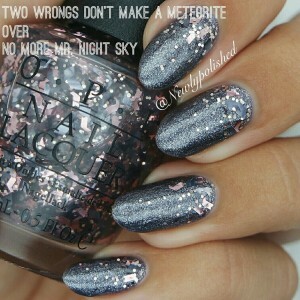 I think it goes great with ’No More Mr. Night Sky’! The formula is good and no fishing required. 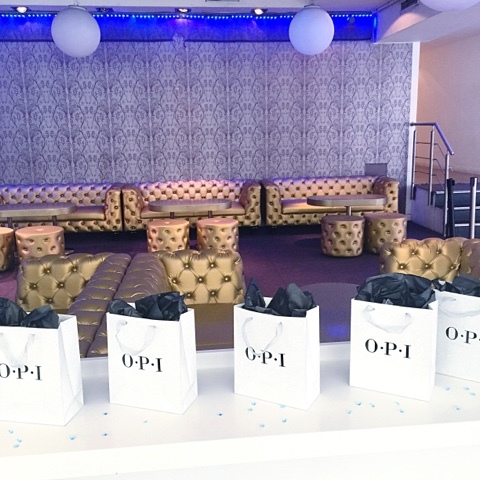 Last, but DEFINITELY not least… ’Give Me Space’! I love, love, love this color! It so sparkly and deep that you can almost loose yourself in the color. My absolute favorite among the 18 colors. 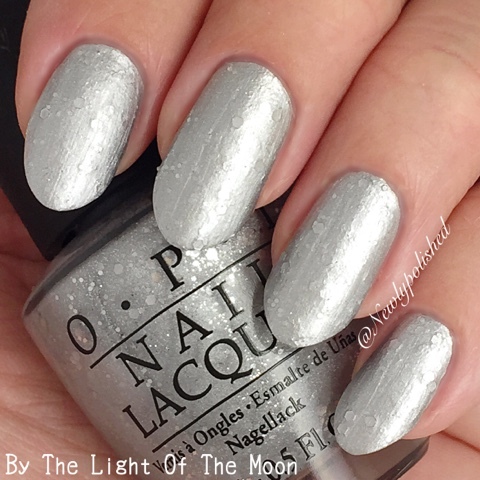 The formula is great and opaque in two coats. I hope you guys have enjoyed our swatches and if you have any questions regarding the line, just comment below! Ok guys, this is IT! This years holiday collection by OPI. And it is all about the glam. 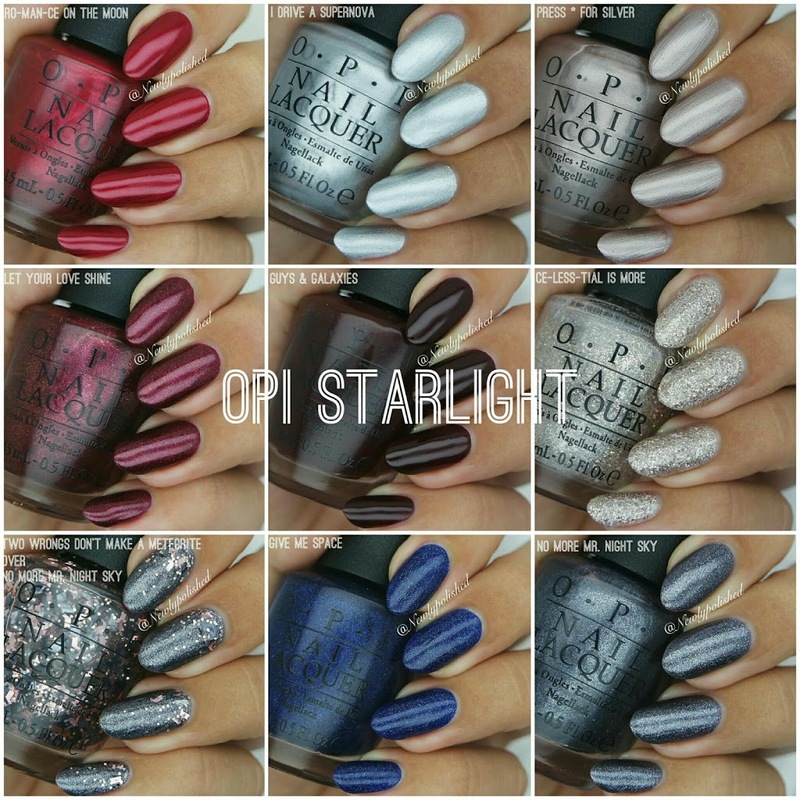 Starlight is its name and it sure lives up to it, prepare to be dazzled!